So, What's a Particle System? Rocket Club has its own idea as to what a particle system is, so my apologies to any particle system purists in the audience. This picture has a single particle system in it, one which is bound to an object (the fire is rising up out of the wooden disk below it). While not obvious from this still image, there is a constant stream of random fire boiling up and out. It's real pretty. In this particular image there are 40 'particles' at any given time. Each particle is born at the bottom, and rise upwards and enlargens and fades. Where 00000001 is *my* developer serNum and you would add yours to your own folder. Feel free to rummage through my particle systems for ideas and possibly additional documentation. But remember, the INI file defines a 'type of' particle system (fire, smoke, snow, etc) but it is your dna plan file which calls out which type of particle system (if any) which is to be used with that object. A particle system has one or more emitters which define how new particles are generated. A campfire particle system might have one emitter for the flame, and another emitter for background smoke, and perhaps a third for the occasional popping ember. Individual particles may stay as fire and fade, or evolve into smoke. 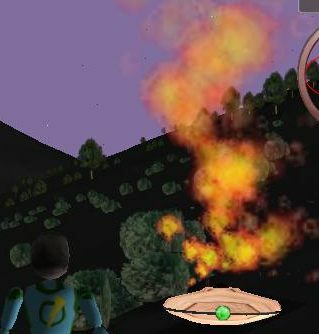 The physics might change with each stage, with fire rising quickly, embers affected by gravity, and smoke billowing outwards. Individual particles eventually die and then are reborn as newly emitted particles, allowing the system overall to use a well-defined maximum number of particles. As a responsible particle system designer, you need to focus on keeping the particle count small and the physics computations simple. The illusion of a solid 3D mass of plasma comes from the individual images not having hard outlines and thus their points of overlaps are not apparent. This also requires the use of 'alpha transparency' so that you can control how much one particle can be 'seen through' another. Over the lifetime of a particle, it's opacity will probably change. Most particles 'fade out' by having their opacity go completely transparent over time. Once the particle is completely transparent, it can be recycled without the viewer noticing it popping out of existence. Your emitter and stage configuration can descript which cell image to be used for an individual particle. This might be random, or you might vary it with stage or emitter, or you might even play the cells in order as a little cartoon over the life of the particle. Again, substitute your own serNum for the 00000001. In theory, you could use the same textures on your models, in theory. but you probably wouldn't want to. If your particle image file does NOT have alpha in it, then you will see a bunch of square images with some background color, instead of nice soft particles. A sensitivity to gravity (a value of 1.0 means earth normal gravity, pulling DOWN). Negative values push 'up'. Remember: gravity is not a velocity, it is an acceleration. Possible ground collisions (particles can sense a ground collision, and change stage as a result). Only use this when needed, as it is reasonably expensive. Opacity Change. A particle can vary its opacity from a start value to an end value over the lifetime of a stage. Lifetime. A particle (stage) can have a finite lifetime (in seconds) after which the stage completes and the particle either dies or switches to a new stage. [Texture] defines the texture file asset and how many rows and columns it includes. Triggers are un-documentable at this time, so we'll just cover the simplest case of an object (like a campfire) which just emits particles constantly. I won't kid you, I am not very good at this. I struggle with mapZone2 to get something useful. I know mapZone2 can do ANYTHING, but it's still hard for me. When you have been successful you have an image file in some format (bmp? jpg?) where beautiful flame/smoke/whatever plasma is on a black background. I then make a NEW file, with a film-strip shape (say 1024 x 64 pixels to make one row of 16 columns) and make it solid black, then copy bits of the beautiful flame into individual cells (the original image being a bunch of individual flamey bits) nicely centered for my needs. Converted to a PNG file with an alpha layer that makes the black completely transparent, and 'dim' colors semi-transparent. So, you have generated a beautiful filmstrip of images in a single file with a black background. Keep that file around forever, as you might need to edit it someday. But now we need to make a PNG file with that black background turned into alpha transparency (and the 'dimmer' parts of the image to be SEMI_transparent). 3.) From the LAYERS/MASK menu, select "Add Layer Mask"
6.) From the LAYERS/MASK menu, select "Apply Mask"
7.) No obvious change appears in the image, but you have copied the layer mask to the alpha channel of the image, and deleted the layer mask. And, of course, use your own serial number. Copy the file to your assets/TEXTURES folder. It can be tedious having to restart the game and travelling to some location every time you tweak some configuration value in your particle script, so I added a command to the DEBUG menu. It is currently the 'reload scripts' command and it causes all action scripts and particle definitions to be reloaded. So, on a good day, you drop an object with your particle system on it, decide what you need to change, then, without stopping the game, edit the particle .ini file, save the changes and select 'reload scripts' to have it take effect. Where you provide the name of the particle asset you want to try. For particle systems which are intended to be bound to a DNA object, this can be a little odd. Probably your avatar will be used as the source object. Then later you just type "/fog" to play that. The 'play' command is just for you, no one else sees the particles you are playing. At some point the peer to peer file system will automatically share the PARTICLE assets and their attendent texture images. That may be spotty right now, my apologies. This example has hard particles which fall rapidly in a straight line until they hit the surface, at which point they 'bounce' by going through a couple extra stages with an inversion of Y velocity on each bounce.